Oh, how I dislike the 5k, as it’s a sprint from start to finish. This sprint was particularly difficult, as the temperature was unseasonably hot, and, given, that the race began after 2 pm, the sun beat down on us, and also reflected off the pavement. I ran shirtless, as was glad that I did. 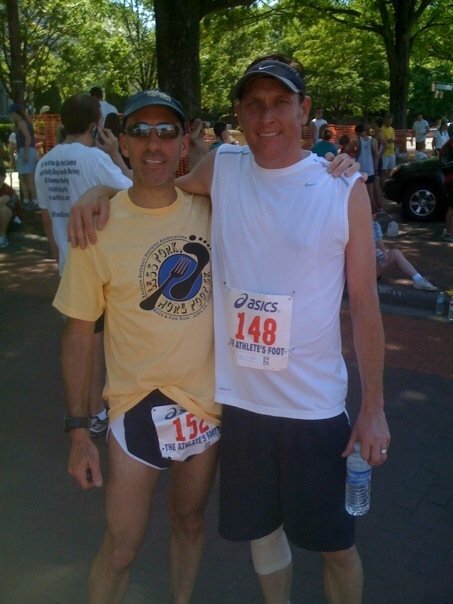 Jeff and I got there at about 1, so I ran the course at an easy 7:30 mpm pace to warm-up. I’ve had some stiffness in my right hip and right inner thigh, and I was concerned that this would impact my performance. While there was some tightness during the first mile or so of my warm-up, I didn’t experience any pain or discomfort during the race. I did some yoga stretches and some pick-ups, and got ready for the race to begin. Given how many 5k races I’ve run, it’s difficult for me to get too excited. It was an out and back course, starting and finishing on Clark and mostly run on Oberlin. There was a tailwind out and a headwind back. While the headwind felt nice, it was surprisingly slow, reflected in splits: 5:41, 5:58, and 6:05. Did I mention it was hot! I was parched the entire time, and continuously licked my lips. Yes, there was one water stop, just past the turnaround. Unfortunately, there was just one swallow in the cup. The race began shortly after 2, and Paul F., the eventual winner, led from the start. He was followed closely by two runners from the TAF team. I caught them both at about the ½ mile mark, and they finished in 4th and 5th places. Not much else to report about the race, as I ran and finished in 2nd place. 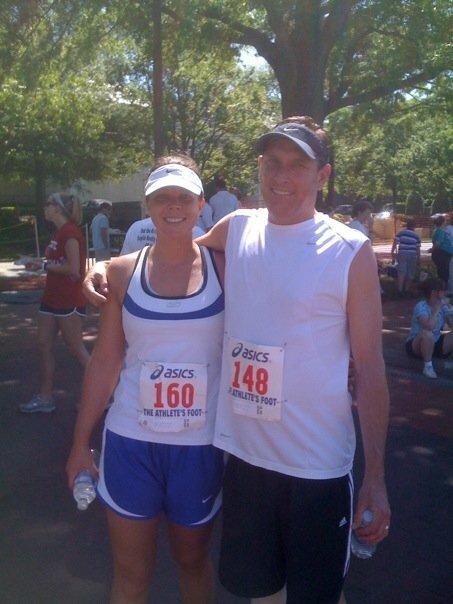 This was Jeff’s first 5k race ever, so I promised I would run him in. I saw him as we passed close to the 2-mile mark for me, the ¾ mile-mark for him. He was running, and looking strong, so I yelled encouragement. Tegan, his friend and training partner, also ran the race, and I also shouted words of encouragement to her, too. As soon as I ran across the finish line, and grabbed a cold bottle of water and ran to meet Jeff. He was walking when I saw him, and he was also very thirsty. Good thing I brought the water! He caught his breath, and starting running once again. He did stop to walk one last time, but ran from about 2.75 to the finish. In fact, he kicked it at the finish, and I was surprised (and delighted) with his very strong finishing kick. As I always say, it’s not how you start; it’s how you finish. I grabbed another cold bottle of water and ran back to run with Tegan. I ran her in, and she also had a nice finishing kick.